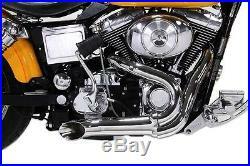 Chrome 2 into 1 exhaust lake style header pipes are designed to look like the hot rod side exhausts with 12mm oxygen sensor bungs. 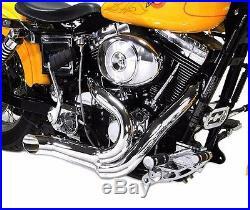 Header pipes are 2 with 16 gauge steel construction. 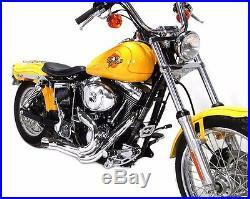 Will also work on many Rigid, Chopper, and Bobber models with left side drive and forward controls only. NOTE: These pipes will not work with floorboards unless your willing to space out and/or modify to make them work. Tech Note: We have not verified fit on Touring models, Mid Controls, or Floorboards models. 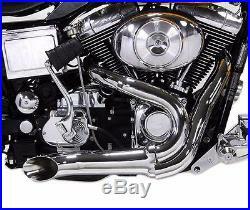 The item "Chrome Wyatt Gatling 2 into 1 Exhaust Lake Pipe Header Harley Chopper 12mm O2" is in sale since Tuesday, January 26, 2016.